The draw wells of Hortobágy, the blooming cotyledon, the mirages of the endless grassy plain, the inns and the sight of the herdsmen cracking whips all evoke the past but the future is characterised by dynamically developing large towns, the centres of education and cultural life. 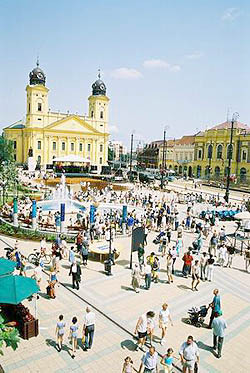 Debrecen, the civic town with its centuries long traditions is not only the seat of the county, but also the centre of the Great Hungarian Plain, as well. The county has few rivers but it is rich in artificial lakes and thermal water. 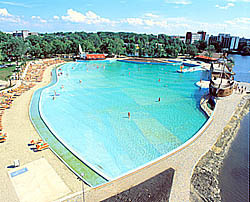 The most famous thermal bath is in Hajdúszoboszló, where visitors, who either wish to recover from an illness or would like to relax, are offered a variety of programmes, a chute park and attraction bath. In the park outside the bath you can find a unique attraction: the Bell house, a spectacular architectural work presenting a collection of 46 bells. Csonkatemplom (broken church) is the oldest Calvinist church of Debrecen. Its name refers to the fact that the onion-shaped spire of its tower was broken by strong wind. After this, it was converted into a bastion. Another broken tower (Csonkatorony) can be found in the county, in Berettyóújfalu. This tower is the only remained part of a former Romanesque monastery and was named by the locals. The neoclassical Calvinist college of Debrecen was built according to plans by Mihály Péchy. The impressive building is decorated with engaged columns and a projection with a tympanum, next to which you can see the eminent figures of Reformation: Calvin and Zwingli. The Great church, which is not only the symbol of the city but also that of Hungarian Reformation, was also built in neoclassical style. Going up to its western tower on 260 steps you can see a wonderful view of the city. Hajdúböszörmény was the seat of the "hajdú" (foot-soldier in the 17th century) district, in the former seat building you can find a museum today. In Hajdúdorog you can find a three-nave Greek Catholic cathedral, next to which you can see the oldest part of the town, the walls of a mediaeval fortress. Significant relics from the Copper age were found by archaeologists near Polgár. Other sights in the region include the cemetery with headboards in Hajdúdorog, where you can see boat-shaped headboards referring to the ancient Hungarian past. The lovers of fishing can visit the group of lakes near Komádi. 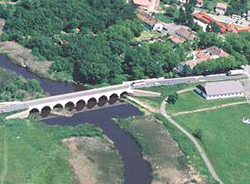 Those who are interested in the romantic puszta, must see the Hortobágy National Park and the Nine-Arch bridge. In the puszta, which is part of the World Heritage, the rich traditions of nomadic animal breeding are presented and you can see indigenous animals including the grey cattle and a Hungarian variety of sheep called racka.